In 1999, the newspaper Politiken ran a readers’ competition to find the best Danish books of the century. 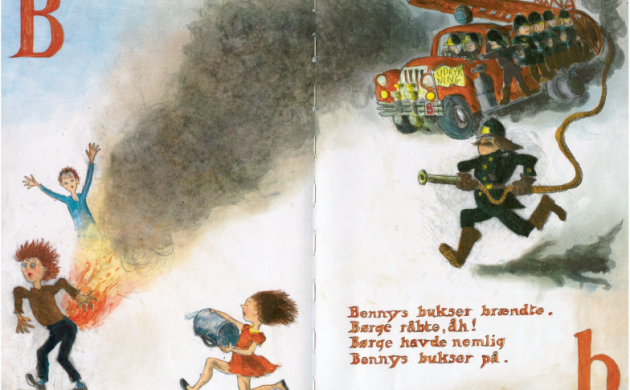 Halfdan Rasmussen’s ‘Børnerim’ (children’s rhymes) from 1964 came in 14th – an extremely impressive placing for any children’s book, and even more so for what is basically a collection of nonsensical verses. In the 1960s, Rasmussen set about revolutionising learning-to-read textbooks, transforming every Danish letter into a fantasy world of strange and peculiar adventures. In 1967, ‘Halfdans ABC’ rapidly took first place on the reading lists of every elementary school – from the villages of southern Jutland to the inner-city housing estates of Copenhagen. Like the name suggests, the book is filled with tongue-twisting, humorous, concise, limerick-style rhymes for every letter of the alphabet. The simple title led the former culture minister, Brian Mikkelsen, to state in a memorial speech on the poet’s death in 2002 that he was known to most as simply ‘Halfdan’. Kids whose reading wasn’t quite up to scratch didn’t have to miss out either; like many of Rasmussen’s texts, ‘Halfdans ABC’ is as much about songs as poetry, and it was published as a CD in 2001. ‘Halfdans ABC’ is vividly illustrated by Ib Spang Olsen, whose animated drawings are as much a part of the Halfdan world as are his rhymes. Complementing each other perfectly, their collaboration began in the 1950s and continued throughout Halfdan’s life. And yes, fans of the action film genre are right to find the name familiar: Ib is the father of Danish films’ answer to Tarantino, Lasse Spang Olsen. How does one begin to describe Halfdan’s style to the non-Danish speaker? To begin with it’s important to remember that poems are basically songs, and that lyricism is part of a long-lasting tradition in Danish literature. (Many of the works of Benny Andersen, a living national treasure, can be appreciated in musical form and indeed listened to on CD.) One need not endure any of those untraditional, non-rhyming poems in Halfdan’s realm, and the satisfying end-rhymes are combined with plenty of alliterative wordplay for kids to get their teeth into. It’s all about the sound and rhythms of the words, not how they look on paper. Simple nonsense rhymes for children may sound a little juvenile, but Halfdan was a writer of adult themes too, who only really found his place in national history as a children’s writer in the latter half of his life. In his poems for grown-ups, the fantastic creatures are replaced with a political consciousness: no surprise, then, to discover that the young Halfdan Rasmussen was active in both anti-fascist and anarchist syndicalism movements. This was to be the platform in 1936 for his debut as a poet in the ultra left-wing weekly ‘Arbejdet’ (‘The Work’). He was first published in book form in 1947 in the anti-war work ‘Soldat eller menneske’ (soldier or person). The son of a cabby, Rasmussen was a thoroughly working class boy from the Christianshavn neighbourhood of Copenhagen. Known to his readers simply as Halfdan, he was truly one of the people, and with his passing in 2002, stated the culture minister, the country lost a great humanist. Lost, but not forgotten, the legacy of his writing remains and endures. In many ways Rasmussen has set the standard for children’s writing in the new century, both as a role model and yardstick for today’s children’s writers.